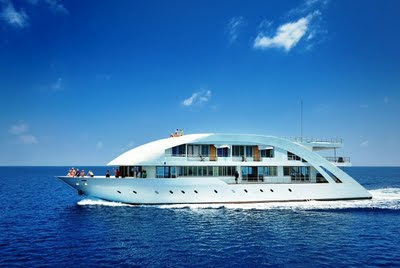 MALDIVE MOSAIQUE is the newest luxury dive vessel available in the Maldives. As an introductory offer they're discounting 30% on any bookings confirmed by August 31st, 2011. Diving is also reduced to only US$35 per person per day for 2011. MALDIVE MOSAIQUE was designed to incorporate a symmetry of inside and out and guests can enjoy panoramic views of the beautiful Maldives from as many vantage points as possible. Other special and unique features include a fully equipped Dive Center, Health Club with a gym and Sauna, the Sompoton Spa offering a range of massage treatments, private balconies and outdoor baths. Her 120sqm sunbathing deck provides plenty of outdoor space for relaxation and a Jacuzzi for 8 people. 1 x Sky Light Suite is a massive 80sq meters and offers a king size double bed, 2 day beds, 42” LCD TV, private bar and a full sofa set. The suite is located at the front on the 3rd level offering a mesmerizing panoramic 270 degree sky view. The Sky Light Suite has a private balcony, beautiful bathroom with modern amenities, outdoor bathtub and rain shower. Enjoy at your private sun chair at the room balcony overlooking the breath taking scenery. 2 x Cruiser Suites measure 26.5 sq meters and are very spacious equipped with a standard double bed and a full size day bed, located on the lower level. These suites are equipped with beautiful and large bathrooms with modern amenities, utilities and facilities. 4 x Sea Breeze Balcony Rooms have 24 sq meters of space and complement all aspects of a Sky Light Suite except the sky view. The Sea Breeze Balcony Rooms each have a private balcony, beautiful bathroom with modern amenities and an outdoor bath tub overlooking the scenery. 4 x Cruiser Cabins measuring 15 sq meters are standard double bedrooms featuring luxury boutique design. The cruiser rooms are located on the lower level and are equipped with beautiful bathrooms with modern amenities as well as all the modern utilities and facilities offered in the suites such as flat screen TV, bathtub, hot and cold shower. Cabins can be configured as doubles or twins and 3 cabins also have a day bed for an additional child.